Merida’s visual beauty is sublime, but it’s the tantalizing aromas wafting through its vibrant plazas and candy-colored streets that grab my attention. 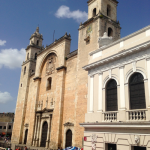 If you’re like me and gastronomy shamelessly rules your travel decisions, book your ticket to Merida pronto. Culinary travelers have struck gold as Merida offers the Yucatan’s distinct flavors as well as a range of sophisticated international influences. Your taste buds are guaranteed to be in overdrive from the moment you hit the ground. 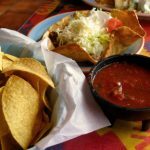 Yucatecan cuisine is unique from the rest of Mexico. Its edible ingenuity derives from a blend of ingredients used by the ancient Mayas mixed with flavors brought by the Spanish during the Colonial era. A smattering of innovative contributions from around the globe including the Caribbean, Europe and the Middle East, add to the savory melting pot. Historically, the Yucatán Peninsula was fairly isolated from the rest of the country, but its proximity to important ports encouraged consistent exchange with the international community. This influx of exotic flavors facilitated an eclectic culinary conversation, forming the foundation for one of the most diverse cuisines in all of Mexico. A little bit of this and a little bit of that equals a powerful mix of tastes that are difficult to recreate outside of the region. Throughout your Merida eating adventure, you will note the use of toothsome condiments and spices such as pumpkin seed, oregano, red onion, sour orange, sweet chili, achiote and habanero. Dishes are accented with a subtle touch, so expect refined rather than heavy-handed flavors. To sample authentic versions of regional specialties, make like a local and head to one of the two branches of La Chaya Maya. I’m still craving La Chaya Maya’s Cochinita Pibil. The pork is marinated in a sauce of annatto and sour orange before being slow-roasted, resulting in a fork-tender dish with soul-satisfying flavor. If you’ve saved room for dessert, order the Caballero Pobre (poor gentleman) a mouthwatering version of French toast that is served with a scoop of ice cream. Another classic Yucatan specialty is papadzules, tortillas dipped in a sauce made of pumpkin seeds and stuffed with hard-boiled egg and topped with a habanero-infused tomato sauce. Don’t miss the muy Mayan-influenced tikinxic, a dish made of fish marinated in achiote, then wrapped in banana leaves, roasted and served with a rich sauce of tomatoes and habanero. I ventured to the sleepy seaside town of Progresso to eat this dish with a view of the ocean. 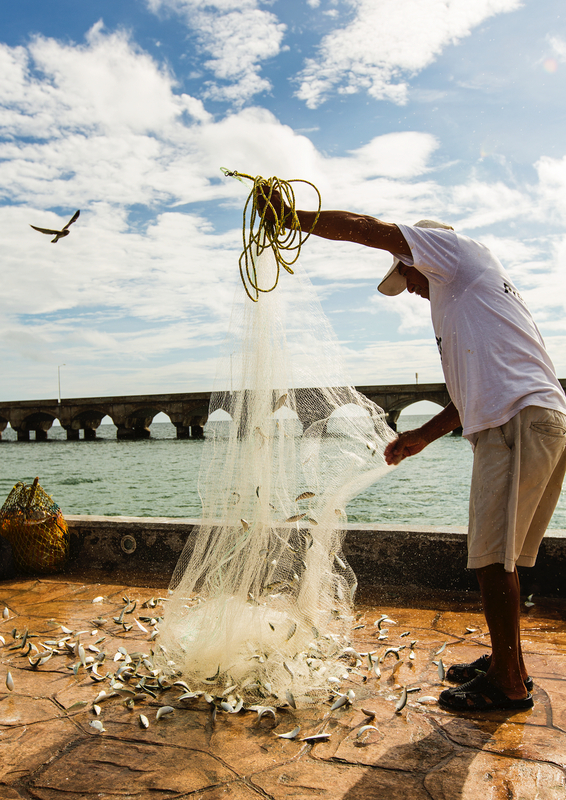 If you’d like to smell the sea air, it’s an easy bus ride from Merida and you’ll have your pick of eateries that specialize in seafood. I chose Restaurant Flamingos, a breezy beachfront eatery. If the fish they serve were any fresher, they would be swimming. Street food was practically invented in Mexico and carts around town sell pan-Mexican goodies like warm churros dusted with fragrant cinnamon sugar and fresh sweet corn-on–the-cob. For a local take on street eats, order marquesitas, crispy crepe-style pancakes filled with anything from chocolate to cheese. 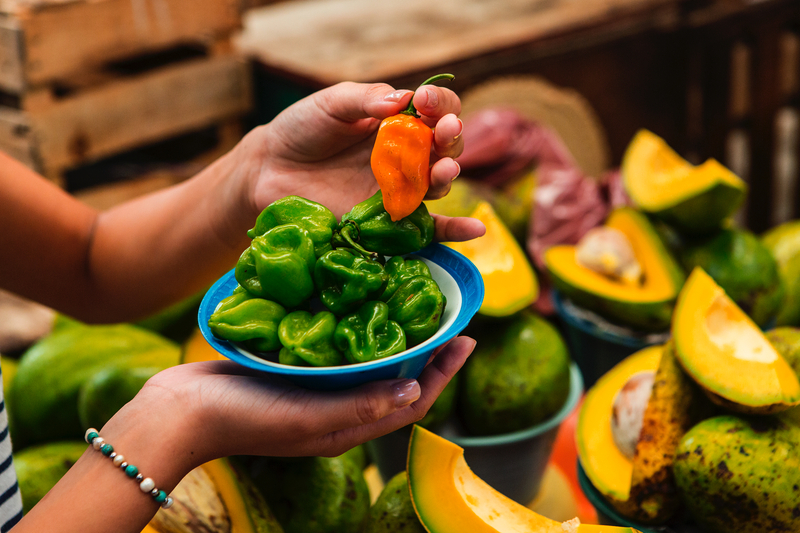 These nourishing snacks cost only a few pesos. The region’s liquid delights will wet your whistle. If you’re skipping alcohol, consider sipping horchata, a smooth rice based beverage. Locally grown chaya leaves are blended with fresh limeade or orange juice to create an equally salubrious beverage. 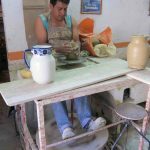 A potent potable is Xtabentún, better known as the “liquor of the gods,” made of honey and anise. The flavor profile was reminiscent of Fernet-Branca only on honey-laced steroids. Michelada, a combination of beer, lime, salt and hot sauce, is a fine way to combat Merida’s sultry temperatures. Merida’s geographic position historically encouraged trade and is the backbone of this tolerant community’s open-minded attitude that extends to its foodways. Locals have embraced many foreign products. Gouda cheese, called queso de bola, is consumed in such massive quantities that locals give the Dutch a run for their money. At Oliva Enoteca, close your eyes and savor Roman-born Chef Stefano Marcelletti’s feathery-light hand-rolled pasta and you’ll swear you in a trattoria in Testaccio. If you’re lucky enough to have an Italian nonna of your very own, the flavors Chef is cooking up may have a Proustian effect. The kitchen utilizes straight-from-the-farm produce to enhance their pasta, risotto, meat and fish. Marcelleti’s food is spectacular in its simplicity. The essence of the primary ingredients shine brightly, resulting in la vera cucina Italiana. Few chefs can boast the international resume of hometown boy Roberto Solís. He learned the finer points of New Scandinavian Cuisine under the tutelage of Noma’s Rene Redzepi, a bona fide culinary demi-god. He did a stint at Chef Thomas Keller’s kitchen at Per Se in New York City. A stage in Tokyo schooled him in the techniques of Japanese Minimalism when he worked with Chef Narisawa at Les Créations de NARISAWA. These wide-ranging experiences led him to open Nectar, where he has coined the term New Yucatacan Cuisine. He starts with local ingredients and infuses them with the cutting edge techniques gained from years of working in the world’s top kitchens, resulting in a world-class dining experience. Order the black onions, charred to a dark richness and deep flavor that I never knew existed in this humble bulb. Traditional meats such as deer, suckling pig and quail are unforgettable. 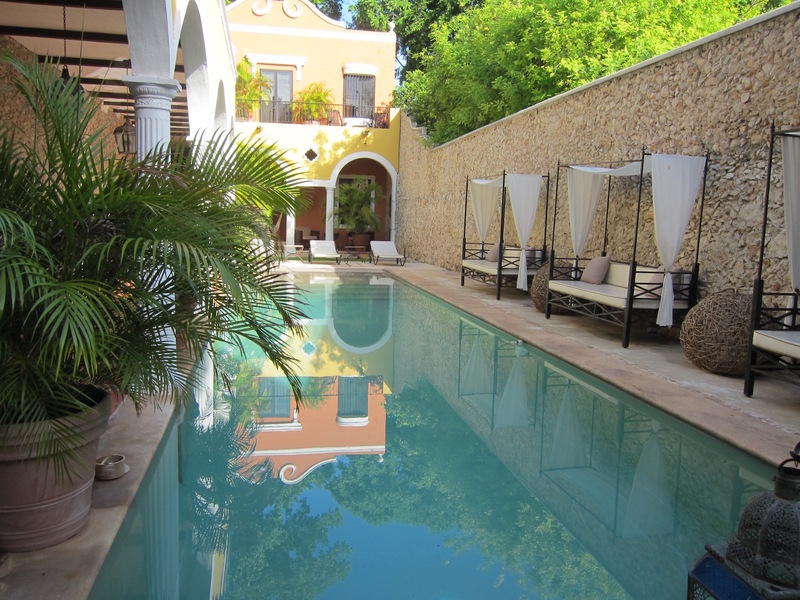 I stayed in the lovingly restored Hotel Hacienda Merida. It’s a shady oasis and the delicious breakfast, served poolside, is reason to get out of your comfortable bed. Perfectly ripe tropical fruit is artistically arranged and warm rolls are served with local honey that is collected from stingless bees. Their version of the local morning classic huevos motulenos is an eye-opener. It’s a fortifying combo of fried eggs served on a bed of tortillas with black beans and a tomato sauce that has been enriched with ham, peas and cheese. Very good article and fantastic pics, Allison. Thanks for the info. We were all set to arrange a 2 week get-a-way to Tulum, this Columbus Day Holiday in October – until we read about the trouble there in THE NEW YORK TIMES,. So, we started looking at Cancun. After reading your article we’ll look into a trip to Merida. 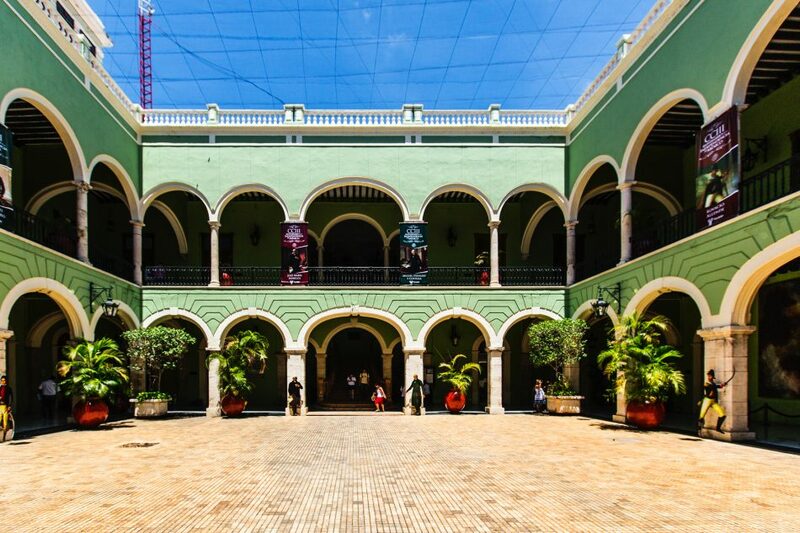 I’m a big fan of Merida, but don’t let the New York Times article scare you away from Cancun. There is absolutely no reason not to visit there. 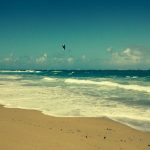 There are plenty of legal and open hotels, great restaurants and beach clubs and probably the best beach in the world. The NYTimes article, like most media, made what happened sound scary. But its not in any way a danger for tourists. Both Tulum and Merida are well worth a visit… and you can do both in two weeks!! So glad this story was helpful. I hope you will love Merida as much as I do. It’s such a special, vibrant place. I can’t wait to visit again. We lived in Merida for over 4 years and have warm memories of it and the surrounding Peninsula, nothing like it. There, while being Mexican, we are definitely Not Yucatecan and we feel it, it’s amazing, a different country within our own. The food is incredible and the sights can’t be beat but most of all the warm Maya that share their wonderful heritage with all of us. Made wonderful friends from every corner of the world but some of the richest times were with Mayan families in the small towns learning their ways and spending time with amazing people. I miss it still and hope to return soon. Great article, glad you enjoyed your visit! Queso de bola is EDAM cheese, not gouda by the way…! Hey Allison, as a transplanted Canadian to lovely Merida, I’d recommend Manjar Blanco over the Chaya Mayas, and La Pigua is fantastic for seafood. Basic ambience but great food! Apoala on Santa Lucia Sq is a tasty fusion of Oaxacan and Yucatecan, and another fave spot of ours. After reading your story, I’m reminded to go back to Nectar! Great post! Thank you for these mouth-watering suggestions, Alison. I am plotting my return to Merida so I can sample the yummies at La Pigua, Manjar Blanco and Apoala. Thank you for the correction, Stewart. I will note that queso de bola is edam cheese! We really loved the exquisite food of Oliva Enoteca. But you must try the food and ambience at Door 54. Georgina puts out a lovely menu including some tasty offerings for breakfast. 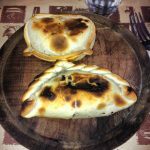 I’m using this article for people’s recommendations for where to eat in Merida! Bill, thanks for sharing. 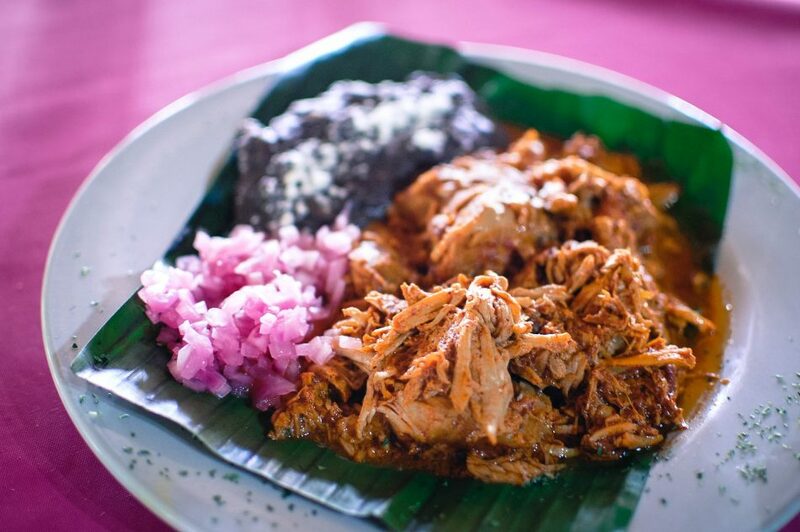 Hi Allison, Thank you for sharing this mouth watering Cochinita Pibil. If I may ask, do you have a recipe on how to do it? Arroz Valenciana and Paella are my favorites. Cheers from Qatar! Thank you for mentioning Door 54, Bill. Breakfast is my favorite meal and I can’t wait to sample Georgina’s morning goodies!